So easy it is to blame poor Sebastien Ogier for making WRC boring with his Loeb impersonations these days. There he is, determined to not be the next Loeb, and no matter what he does and how hard he fights against the new-Loeb stigma, he eventually ends up on top. And wins. Through no fault of his own, that’s for sure. Even if this or future seasons turn out to be another Seb fest, it’s hardly fair to lay any real or serious blame on Mr. Ogier for being the fastest and the most consistent driver at the moment. It was actually rather interesting to see him not claiming the top spot yesterday, and for a while it really looked like he is not another unbeatable machine (and for sure he isn’t, but that’s up to his opponents), driving equally unbeatable car. But rallies are, still, won over the course of few days, so if Seb looked vulnerable yesterday, he ended today’s day 2 with a solid lead. He was fast, controlled his pace, kept himself out of trouble and thus was able to cash in on his opponents’ mistakes and misfortunes. Evgeny Novikov went off in what looked like a misheard or misread pace note. Video of the crash went viral, and debate is going on about what actually happened. To me it looks like he either was too late in crossing to the right hand side before the crest, or he misheard and prepared to attack the jump on the left hand side, which then led him into the logs. It really was a split second mistake, but in the worst possible moment. The fact that he forced Kris Meeke to lose time and windshield by not moving his stricken car out of the Irishman’s way also ruined Evgeny’s day. Juho Hanninen did today what Jari-Matti did yesterday, while Andreas Mikkelsen just lost a wheel for no apparent reason. All these problems and loads of punctures usually cause huge gaps in standings. This time around, we still have at least two big fights going on. Mikko Hirvonen was very lucky today and did not end up in a ditch after a nasty high speed spin in “the ruts” stage – he is currently preparing for a flat out attack on the third placed Mads Ostberg, who is only 0.9 seconds behind Thierry Neuville. 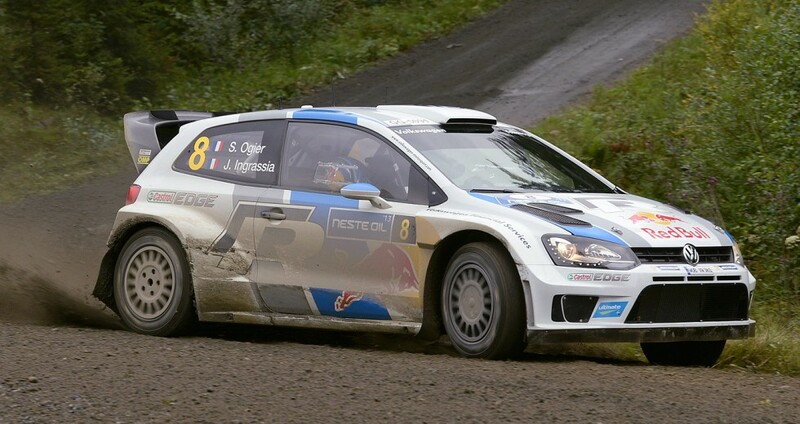 Seb Ogier has a 38 seconds lead and can almost smell another victory. But it’s an action filled day tomorrow, so don’t take your champagne out of the ice just yet. UPDATE: After reviewing this particular incident (Novikov – Meeke one), stewards decided to refund the lost time to Meeke, so he gained back over 23 seconds, and thanks to that is now withing striking distance of Mikko Hirvonen. Previous story There is / was no WRC timing investigation by the FIA, don’t be silly!